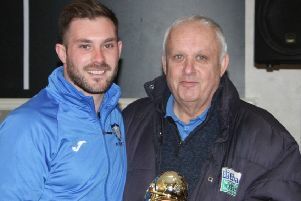 Whitley Bay Boys Club’s U21 team are staging a are staging a group ‘testimonial’ match on April 5 to celebrate and acknowledge ten of their players who have stayed loyal to them for ten years. Kester Miller, Joe Byerly, Jack Moody, Chris Moat, Ben Shaw, Jacques Hall, Alex McQuire, Liam Whyte, Joe Burridge and Cameron Fullerton have reached the milestone. And the club want to mark the rare feat of playing for the same club for a decade through thick and thin. Run by coach Simon Moody with help from Phil Burridge, Dave Byerly and Danny Nelson to mention a few, they are hopefully aiming to raise £1,000 in support of Macmillan Cancer Research by playing Cullercoats first team at Heaton. All are welcome and there will be raffles, spot prizes and refreshments on the night -and the club are looking for any sponsors to help. Anyone interested should contact the club.